Editor’s note: The “V&V Q&A” is an e-publication from The Center for Vision & Values at Grove City College. In this latest edition, Dr. Paul Kengor, the executive director of the Center for Vision & Values, interviews Dr. Gary Scott Smith, Grove City College professor and author of the acclaimed, Faith and the Presidency: From George Washington to George W. Bush, published by Oxford University Press. Kengor: Dr. Smith, you are one of the country’s leading experts on faith and the presidency. Reporters frequently come to you for comment. In that spirit, the New York Times interviewed you last week on the notable fact that President Obama didn’t attend religious services this past Christmas. That’s quite unusual for a president, isn’t it? Kengor: Do you know of any other president skipping religious services at Christmas? Smith: Some probably did not attend religious services at Christmas, but I do not know of any specifically. The media was not omnipresent before the 1960s, so it was easier for presidents’ non-attendance to go unnoticed. However, most presidents have attended church faithfully while in office, including George Washington, John Adams, John Quincy Adams, Andrew Jackson, Abraham Lincoln, William McKinley, Theodore Roosevelt, Woodrow Wilson, Dwight Eisenhower, John F. Kennedy, Jimmy Carter, and Bill Clinton. Others who claimed to have a strong Christian faith but attended infrequently while president include Franklin Roosevelt, Harry Truman, and Ronald Reagan. Obama did issue a Christmas message, as he has done every year as president, in which he encouraged Americans to serve others. “For families like ours,” he declared, “that service is a chance to celebrate the birth of Christ and live out what He taught us—to love our neighbors as we would ourselves; to feed the hungry and look after the sick; to be our brother’s keeper.” Obama has used this latter phrase more than 60 times in his presidential addresses and proclamations. Kengor: Yes, he uses that phrase constantly. 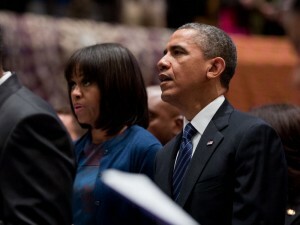 Did President Obama give a rationale for not attending church this Christmas? What’s the explanation? Smith: He apparently has not offered an explanation for not attending Christmas services. He did vacation in Hawaii for five days where he spent time with his family, played golf three times, attended a basketball game, and visited a military base. On Christmas Eve, the president called U.S. armed forces members who are stationed around the globe to wish them a Merry Christmas. Kengor: Moving away from this Christmas example, what about Obama’s attendance at church generally? The New York Times quotes an “unofficial White House historian” who calculates that Obama has attended church 18 times during his nearly five years in the White House, while his predecessor, George W. Bush, attended 120 times during his eight years in office. Is Obama a member of a church? Smith: Obama does not currently belong to any congregation. After attending St. John’s Episcopal Church and 19th Street Baptist Church in Washington a few times, he decided instead to worship primarily at the Evergreen Chapel at Camp David. However, he rarely spends weekends at Camp David. Kengor: Does Obama have a formal religious affiliation? He’s no longer with the denomination that housed Rev. Jeremiah Wright’s church, is he? Smith: Since ending his relationship with Wright’s Trinity United Church of Christ Church in Chicago during the 2008 campaign, Obama has not joined a church. Kengor: Has Obama explained his lack of church attendance? You and I both have written on President Ronald Reagan’s faith. Reagan stopped attending church regularly after the assassination attempt, though (to my knowledge) he always attended Christmas and Easter services. Reagan gave a host of reasons for his infrequent attendance as president. (He returned to church regularly again after the presidency.) Has Obama addressed this? Reagan was constantly asked to address it, and did. Smith: Obama has seldom commented on why he rarely attends church. His basic explanation is that he dislikes being on display when he worships (many people have snapped pictures of him with their cell phones and some pastors have spoken directly to him). Kengor: In the Times article, you’re quoted as saying, “I would argue that Obama’s faith has been one of the most misunderstood of any president.” What do you mean by that? Smith: From 2008 until now, many Americans (as high as 20 percent in some polls) have identified Obama as a Muslim despite the controversy over his membership in Wright’s church and his many professions of Christian faith. Because of his connection with Wright, others have labeled him an advocate of black liberation theology. Many political and religious conservatives complain that Obama’s claim to be a Christian is disingenuous and entirely politically motivated. Obama has been labeled “the most explicitly Christian president in American history” by historian John Fea and America’s “Most Biblically Hostile” president by evangelical author and activist David Barton. Many conservative Christian books and websites argue that Obama is trying to destroy the nation’s Christian heritage and cannot possibly be a Christian because of his stances on abortion, gay marriage, and government redistribution of wealth. On the other hand, liberal Protestants and Catholics and some evangelicals praise Obama’s concern for aiding the marginalized, oppressed, and poor. Some younger evangelicals support Obama because of his commitment to social-justice issues like overcoming racism, combating poverty, and tackling global issues like AIDS. Kengor: As you note, conservatives who don’t like Obama argue that his faith is not genuine, while liberals who do like Obama argue otherwise. Others take a position somewhere in between. What’s your take? Obama’s faith is difficult to decipher, however, because various streams—the African-American church, the Social Gospel movement, mainline Protestantism, and evangelicalism—have all shaped it. On the other hand, as Stephen Mansfield contends, Obama’s “big-tent approach” to religion and spirituality “is perfectly in step with the country he now leads.” Like the vast majority of Americans, he believes that many paths lead to God and that all religions contain fundamentals truths. Similarly, New York Times columnist Ross Douthat asserts that Obama embodies America’s “uncentered spiritual landscape” because like 44 percent of Americans, the president switched his religion as an adult, and because he is part of one of America’s fastest-growing religious constituencies—the “unchurched Christian” bloc. Kengor: Dr. Smith, thanks for your time. I strongly encourage readers to pick up a copy of your outstanding book on faith and the presidency. I think Obama is an enigma…he says he has concerns for the poor while spending millions of taxpayer dollars on luxurious vacations and he has done this since he became President. I don’t sense that he has any personal empathy for others. He has forced American citizens to give up their health insurance and to take only what the government offers; he claims that a couple of million people have signed on to his ‘Obamacare’ while failing to mention the millions more who lost their health insurance because of what he has done, some of these people have grave illnesses and have lost their doctors and their care because of Obama. As for his ‘religion’ – perhaps no one remembers an interview that Obama gave years ago; I don’t remember who the interviewer was but at one point, they talked about faith and Obama lowered his head reverently and softly said…”…my Muslim faith” – the interviewer jumped in quickly to say that Obama mean his ‘Christian’ faith and Obama said yes, that’s what he meant…if he is a Muslim, just say so. I was impressed at the time at how reverently, almost tenderly, Obama said: “…my Muslim faith” – he should acknowledge that and not try to hide it. I like Professor Kengor. This time I won’t take him up on his suggestion.